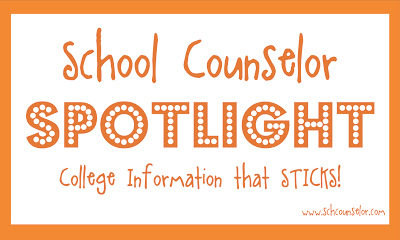 School Counselor Blog: School Counselor Spotlight: College Information that STICKS! 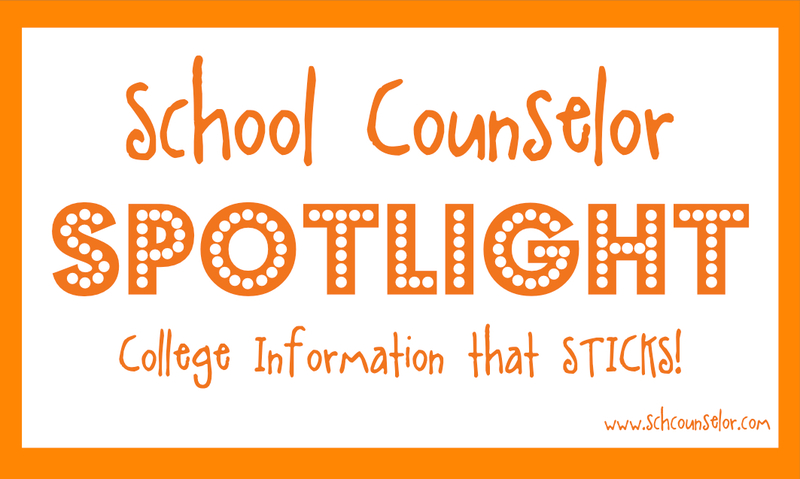 School Counselor Spotlight: College Information that STICKS! While I was at the ASCA National Conference I enjoyed connecting in person with school counselors I have interacted with on Twitter. At the conference, Jeremy Goldman, a high school counselor in Maryland was telling me about how he collects college stickers to display in his office. 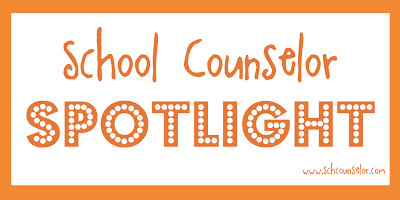 (If you are a school counselor who tweets you may know him on Twitter as @MrJGoldman or @PHSCouns). He even went on a college visit while in Minneapolis to get a sticker to add to his collage. 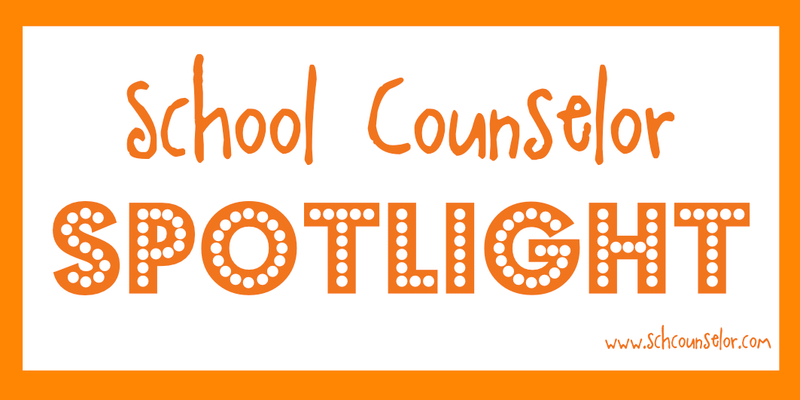 I thought Jeremy's college sticker collage was a unique way to share college information with high school students, so I asked him if he would share about it for the School Counselor Spotlight. For me, it all started with my own experience with college. I was so excited to go to my first-choice college that when I went for my overnight visit in the spring of my senior year, I bought a window decal, and - with permission - proudly displayed it in the rear window of my mother's car. Six majors and four semesters later, upon meeting fellow college students and children from all over the country at my summer job at a sports camp, I realized that I wanted to be a school counselor, partly to offer students better services than I had in school. My friends were from colleges I had never even considered, let alone heard of, in some cases. Granted, I still have pride in my alma mater, but I always wonder how things would have turned out if I had really known my options. 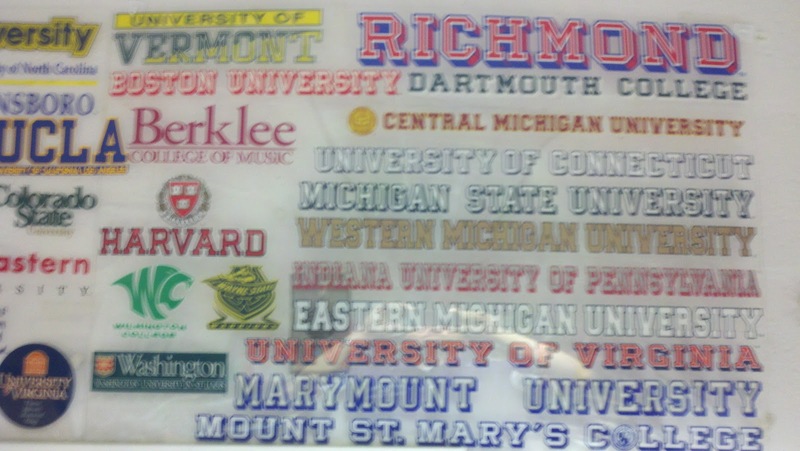 When the time came to interview for graduate school, I picked up window decals from each of the universities I visited. After all, if I was going to go to grad school as many as three states away from home, I wanted to show off my two colleges the whole summer before moving away to study. Well, by the time the dust settled, I had a handful of window decals that would not end up residing on my car's rear window. I observed during my secondary school internships that students' college vocabularies are usually limited to about ten colleges (the one or two closest schools, plus the ones that we see every year in the BCS football and NCAA final four basketball championship games), and they were falling prey to the same ignorance that I had. It would become my mission as a new school counselor to introduce my students to the notion that you don't have to go to brand-name colleges simply because they're all that you can think of, or because that's what the popular kids a year older than you did. Consistent with my professional goal, I began incorporating non-mainstream colleges as reasonable options alternative to the popular ones during my college planning guidance lessons. I also decorated my office (we were not as fortunate as some schools to have a spacious career and college research center) with posters and maps of colleges beyond the ones everyone knew, and I had amassed enough window decals to fill a whole 24" x 36" poster cover. I have now filled four of these poster covers, and with the connections I've made through my departmental twitter account (@PHSCouns), I hope that admissions offices will start sending me window decals instead of the usual felt banners. The most wonderful byproduct of my obsession is that I now have a clear memory (I'm a visual learner) of the campuses, and can relate those memories to my students when helping them find a sense of "fit." My collection inspires students to go on their own visits with their families, and having it behind me always becomes a conversation piece for the otherwise reticent youth. To me, it's all about creating and maintaining a sense of college-going culture. 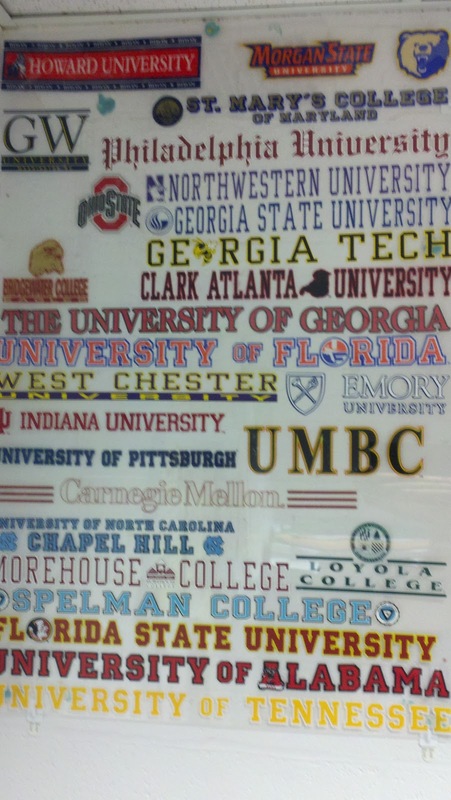 Right now, I am working on a College of the Day project. For each of the 180-ish school days this coming year, I have selected a college - within a 6-hour drive radius - and am writing short snippets to be read during the daily morning announcements. For a value-added factor, I assigned the 11th grade AVID class the project of writing some of them, to directly get them to learn more about colleges with which they were not already familiar. 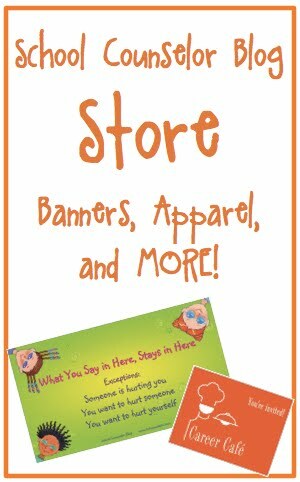 I see these efforts as a way to show students that they have many options. I frequently use the "fish in the sea" analogy, because it is important to note that you engage in a relationship with your college, just like you do with friends and other families of choice. If my efforts result in a student falling in love with a campus that they had not even considered before coming to my office, then it's worthwhile. It's all about having a diverse college vocabulary. Jeremy has made it his goal and mission to give students information about college and universities he has personally visited. First hand knowledge of the college and the campus is priceless for the students he serves who are looking to find a college that fits them! 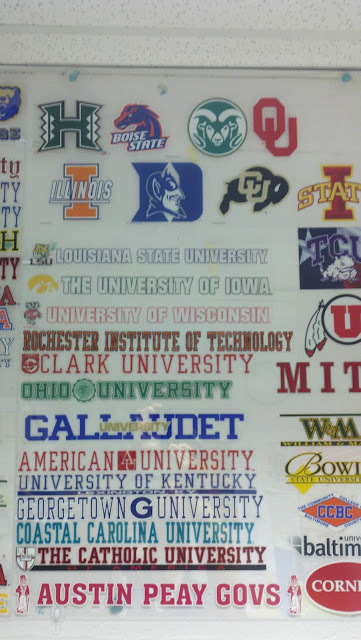 Expanding students' horizons about which colleges and universities they will choose is huge! Jeremy has created a way to share colleges that students may not have heard of and make them accessible. 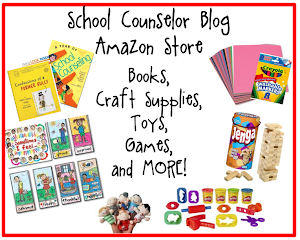 I LOVE LOVE LOVE the idea of Jeremy's College of the Day project! I will have to get him to come back and share more about it after the school year starts! What a cool idea! Having students research the colleges is a great way to expose students to colleges and have them think outside the box about which colleges they will choose! Passion! Jeremy definitely has a passion for helping students find the right college or career choice after high school. It is very evident when you talk to him in person. The fact that he makes it his mission to provide this information to students shows his dedication, excitement and passion about his students and being a school counselor! Thank you Jeremy for sharing your college sticker collage with us! 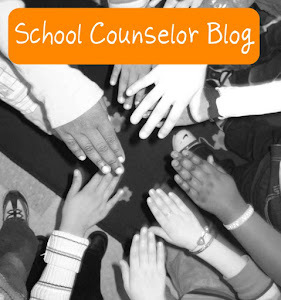 I am sure other school counselors out there will love this idea and want to do something similar in their own school! 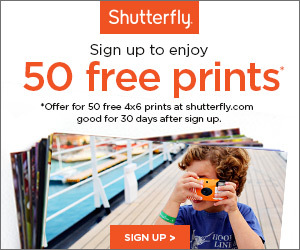 Do you have a unique way of displaying college information? What do you do with information that you receive from colleges?